Now that Max Mosley has allowed an appeal on the espionage ruling from the WMSC, thereby giving Ferrari their day in court, things might go a little quieter on that front for a while. But the continuing saga of Scott Speed and STR will not lie down and die, it seems. Scott has had nothing to say since Vettel took his seat and was confirmed for the balance of the season, so it was reasonable to assume that was an end to the matter, with Scott's plans for the future to be announced at some time. Yet this morning it is reported that Scott's manager, Glen Hinshaw, has pointed out that his client's contract has not been canceled. More will be revealed after the Hungarian Grand Prix, apparently. This has led to speculation in some quarters that Speed might return to the team and take Tonio Liuzzi's seat - and Franz Tost's recent comments show that he is just as unhappy with the Italian's performance as he was with Speed's. Add to this the fact that STR have not taken up their option on Sebastien Bourdais and it looks remotely possible that the suggested scenario could happen. I doubt it, however. Tost's opinion on both Liuzzi and Speed is pretty clear and I cannot see him having Scott back without enormous pressure being exerted by Red Bull, who fund the STR team. It would make little sense for the American to continue with a team that so obviously doesn't want him anyway. But I do think that Red Bull have a hand in all this. Scott is one of their drivers, after all, and they may not be prepared to let him go without offering him an alternative. That could conceivably be a testing role for the remainder of the season or perhaps a seat in an American series such as Champ Cars. No doubt we will know a bit more in due course. There is one more possibility that may be hinted at in Hinshaw's email to the LA Times. Scott has a contract, after all, and STR are effectively breaking it by putting Vettel in his seat. He has a good case for taking the team to court, therefore, and could even add charges of assault, thanks to the incident at the European GP. That could amount to quite a bit of money in damages claims and that thought cannot have been far from the minds of the STR bosses over the last few days. I’m not entirely convinced the STR bosses have a mind ... at least not one recognized by normal standards. While their car has displayed periodic flashes of speed, its reliability has been pathetic. So, who to blame? The drivers of course (who incidentally management hired), for management’s one constant is to never take responsibility for failure. Tost is a bit of an enigma. Berger’s driving performance was some distance from remarkable and his management record posts a magnificent zero. Keeping in mind that ex-drivers (even those as competent as Prost) have not performed well in owner/management roles, perhaps it’s time Red Bull recognized the real problem and looked for competent personnel to run their #2 team. Scott Speed? To denigrate others in an effort to improve ones image is a basic human behavioral trait that I have never been comfortable with. In Scott’s case, I personally hope he extracts the maximum from his detractors. Perhaps that will tend to dissuade others from this all to familiar practice. There was a rumor some time back that Toro Rosso was up for sale (even Michael Schumacher's name was mentioned as a possible buyer) but nothing seemed to come of it. There are usually reasons why these rumors start, however, and it has also been suggested that Berger, who has unexpected financial talents, might intend to sell his share in the team and make a tidy profit. If there's any truth in such stories, it could be that STR are just an investment for its current managers and that would explain their ummm "interesting" management style. Remembering that STR was once Minardi, I hope that the rumors are true and that STR gain some managers who can restore it to the great days of its famous predecessor - not necessarily winners but racers through and through. As for Speed, well, I guess we can only wait and see, David. I just hope something comes of this. It seems very unfair for Scott to lose his seat, or for that matter Liuzzi. Such is the business I guess. I did hear talk about Jean Todt's son possibly being involved in buying the team. I guess this would make sense as that would strengthen there relations with Ferrari, and with customer cars coming next year it could jettison them to fighting for spots with BMW and Renault. This was announced during the British GP I believe. It seemed to coincide with Speeds departure, possibly trying to build an image as "The Other Italian Team". Personally I hope Red Bull does step in and give Speed his seat back, at the same time I like Liuzzi as well, but seems unlikely that would retain both. 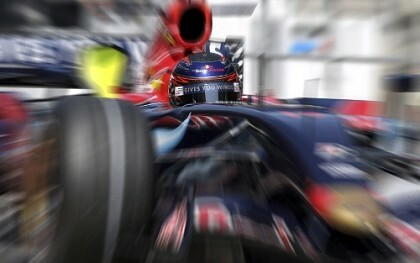 I guess my hope would be that DC would decide to retire to another series and let Vettel take the competitive RBR seat. Red Bull steps and throw Berger in front of a bus and restructures Tost's contract so that every time Speed finishes in the points he has the option the punch Tost in the back. Now thats motivation! I guess if it was a perfect world that could happen, but in a perfect world we would have a race at the Seca. What can I say, Dan - so many good ideas at once! I especially like the thought of a clause that let's Scott punch Tost in the back for every point he scores. Now there's motivation for you! I remember the stories of Todt's son being interested in buying the team but things have gone very quiet on that for a while. It would make a lot of sense, however, with STR already using Ferrari engines. Coulthard is hanging on grimly at Red Bull and has a contract for 2008 already. So it doesn't look as though he'll be going anywhere soon. In fact, looking at the grid, there are not many seats likely to become vacant next year and far too many drivers waiting to get their chance in F1. If I had to guess, I'd say that Scott will be racing in the States in 2008. Are F1 teams allowed to sell driver's contracts in the way European and South American club soccer/football teams can sell their players? If so, STR may be holding Speed's rights deliberately, expecting bidders. Not that I can think of an F1 team that would bid for him now. I've never heard of that being done, Chunter, and, like you, I can't see any team wanting to bid in that particular auction. Usually such matters in F1 are sorted out by money changing hands, which could be seen as one team buying out the contract of another's driver - but that's in cases where both teams want the services of the driver and he wants to move. It wouldn't apply to Speed anyway, as I see it, because the team broke the contract by putting Vettel in the car. Unless Speed agreed to it, that has to be a breach of the contract and Speed is no longer bound by it, therefore. Drivers can and are sold football-style - in fact I think that's what happened with Vettel. He was on a joint BMW and Red Bull contract (BMW until 2009, Red Bull long-term), and I suspect that Red Bull has bought out BMW's share early. Other examples of this are Nick Heidfeld nearly getting bought out of his Jordan contract by Williams in 2004 (eventually the price was too steep) and Luciano Burti getting bought out of his Jaguar contract three races into 2001 and spending the next half-season at Prost. As long as driver/team pairings are confirmed by the Tuesday preceding each race, and no more than four race drivers are used in a season under normal circumstances, the FIA doesn't openly prohibit any particular behaviours. Surely the drivers have a little more say in things than that, Alianora - although I admit that usually they don't have much power and have to take whatever drive comes along. It must be a little de-motivating to have to drive for a team that you never really fancied in the first place. Thank you, I understand how this can play out, but whom the situation benefits is beyond me. Maybe Vettel gets them one point for the remainder of the year, is that worth the trouble? Normally that one point would make a huge difference, Chunter, since the FIA make some contribution towards the costs of the top ten teams in F1. The eleventh team gets nothing and so no-one wants to come last in the constructors' championship. And that one point can be (and usually is) the difference between tenth and eleventh places. Like everything else in F1, it's complicated and motives behind actions can be a lot more devious than appears. Or it may even be as simple a matter as a clash of personalities - Tost didn't get on with Speed and so wanted him out as soon as possible. Who knows? Usually, drivers do get more say than the examples I cited, Clive - hence why the examples were three years apart (2001/2004/2007). Under normal circumstances, the power in contracts is roughly 50/50 between driver and team. However, Vettel more or less asked for this to happen when he signed for both BMW and Red Bull. Jordan were in financial trouble and were pretty sure Heidfeld wouldn't mind (though if they'd known just how keen Nick was to be at Williams, maybe they'd've accepted a lower price and effected the transfer...) and Burti was performing so poorly at Jaguar that he'd lost the power he would normally have had. Who does it benefit? Well, I suppose it benefits Franz Tost's ego. Heidfeld and Kubica benefit, because they are unlikely to have serious competition for their 2008 seats now (not that they did anything to influence this scenario!). Sebastien Bordais benefits because he can see how chaotic STR really are and adjust his negotiation strategy accordingly. But basically, I think the ego argument won this time around. Yes, that's a funny arrangement between RBR and BMW over Vettel. And that is rather like football, where players can be loaned to another club for a season or two. As you say, it can cause problems when the driver suddenly becomes a hot property and I dare say RBR had to fork out some dough to get BMW to release Vettel.